The Clock Tower was originally erected to commemorate those who died in service or were killed in action during World War One. 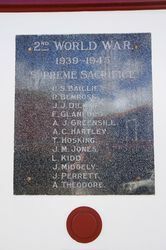 The names of those who died in service or were killed in action of World War Two were added at a later date. The Clock has the words Lest We Forget instead of numbers. 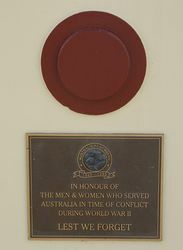 The memorial was unveiled by Raymond Huish, State President RSL, on the 15th November 1940. 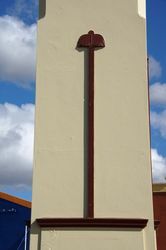 The memorial is in the form of a column 30 feet high with a four faced electric clock bearing the words "Lest We Forget " instead of numbers . 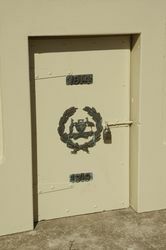 On a plate is engraved the names of those whose memory the monument was erected for. 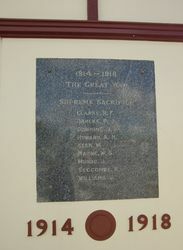 The cost of the monument was £700. Townsville Daily Bulletin, 26th November 1940.